Union Pacific 4-8-8-4 Big Boys were the largest steam locomotives ever built and you'll see them in regular service as they pound westward out of Cheyenne, Wyoming bound for Sherman Hill! The 4-6-6-4 Challenger 3959 puts on a grand show as we pace this sister engine of Union Pacific's present day excursion engine 3985. At trackside, watch her drivers slip as the giant steam engine slowly moves by. The huge 3-cylinder 4-12-2 9000's are there along with the 4-8-4 800's...sister engines of another famous excursion steamer of today, #844. First generation E8's put in an appearance as they lead the Union Pacific's "City of Los Angeles", City of San Francisco" and the "Overland Limited" over Sherman Hill...sometimes with steam helpers! We see the unusual Veranda Turbine and then we are treated to a tour of the Cheyenne yard in 1954 with steam galore. This 50's classic was filmed in 16 mm color from July 1951 to September 1956 and is narrated by the cinematographer himself, Irv August. heinz221254 (zossen ,germany) on 2013-07-23 11:53:25.
steamgiants on the rail full in Action. Choo Choo John (Carbondale, Colorado) on 2013-06-04 15:13:53. I love Union Pacific steam and the Sherman Hill area of Wyoming. This DVD brings that combination together as no other I have seen. WOW!! A great show for the steam fan and railfan in general. This DVD is one of my Top Five favorites of all time. Choo Choo!! Robby (Moorenweis, Germany) on 2011-03-15 04:27:47. 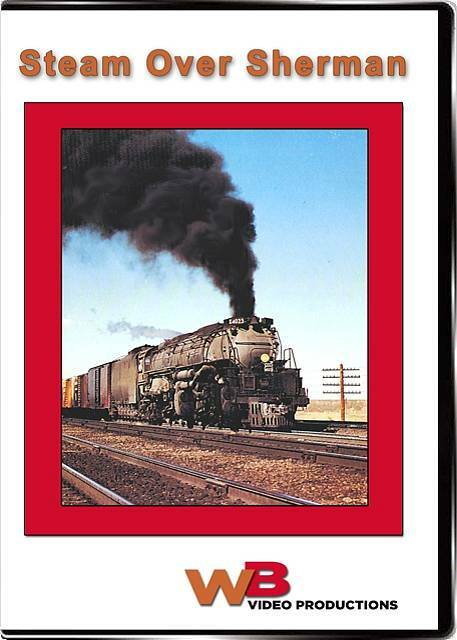 As a fan of steam locos (like these Big Boys) this DVD is a must have. Hard working locos with big trains, very interesting.